Earlier this week I spent two days in Cardiff at the #oer15 conference on Mainstreaming Open Education. I was able to ask one of the keynote speakers, Sheila MacNeill, a question and I asked about what she would like to see happen next to help further openness. Her response was ‘getting senior decision makers engaged’ – and that got me thinking. What would I like to see happen, what would I want, not in my capacity as CEO of the Association for Learning Technology, but as a senior decision maker and as someone who works with others who hold roles of responsibility. Something Sheila had mentioned earlier in her keynote was my answer: I’d like to try and adopt open practice in my role and connect with others who do the same. Like teachers, researchers or developers who share their practice and resources openly, I’ll try to follow their example. To make my work, which is mostly about leadership, governance and management in Learning Technology, an open practice. This is the experiment that I’m starting with this blog post. Let me unpack what I am thinking about: this is not about transparency or democracy. Indeed, the organisation I serve has openness as one of its core values from governance to publishing to the services we provide. I am not thinking about what my organisation does, but what and how I do my job. Like a teacher who may share what they do, I’ll use what I do as a basis for sharing, reflecting and practicing in the open. 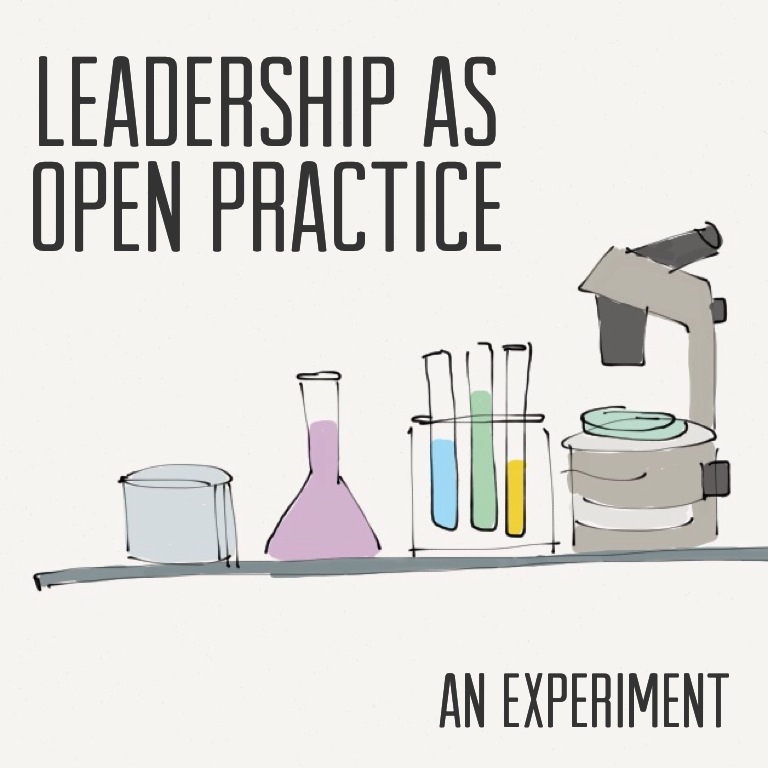 To try and conduct myself, in my role, as an open practitioner, an open leader. That’s the challenge. A quick search shows me that there is already a lot of advice out there about how to become a better leader by using open software, by using social media, to transform an organisation through open licencing… and so forth. But I don’t intend for this, most likely a series of blog posts to begin with, to be about getting ahead by making ‘open’ work for me. No, my main motivation is twofold: to join a community of open practitioners using my day to day work as a basis and to see if this process can make being in a position of power and responsibility less like an island. My experience over the past three years of working with others who hold roles like mine is that most, like me, don’t have a lot of space for reflecting on their practice. I am fortunate to have excellent support from colleagues and my mentor and so I’ve always been able to create space for me to focus on what I do as well as whom I serve or represent. This experiment is about making this space open – transitioning from the safety of an audience of one, me, to the relative uncertainty of open practice. I am curious to see if in a few months or years I, too, become an open practitioner. As a first step, I am going seek others who have done the same and see what I can learn from their example.